This is a picture of me when I was 8 or 9 and I think it is one of my favorite pictures of myself. You have to look past the horrible perm because it was the 80’s and no one explained to me that you should never get a perm when you have naturally curly hair. My mom was never a girlie girl so she had no idea about perms or anything else. And you have to look past the mushroom head hair cut too. You have to look past the acid wash, tight rolled jeans. You have to look past the matchy-matchy shirt and socks and fanny pack. 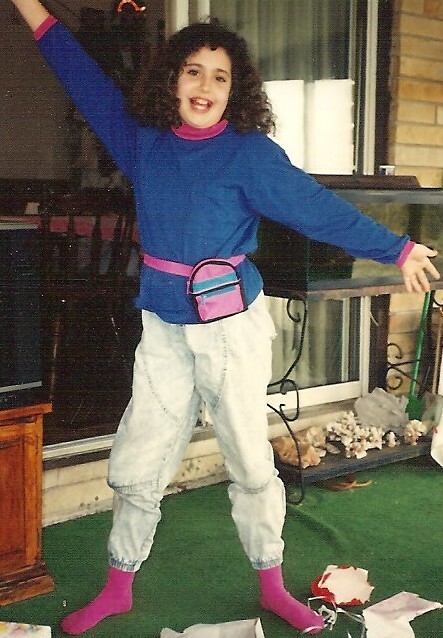 I mean where do you even find a fanny pack to match your outfit, even back in the 80’s? Look deeper at the little girl with the expression of absolute joy. Even under all those clichés that little girl felt beautiful. She felt free to be herself. She wore bright-colored clothes because she felt bright and colorful inside. Peer pressure and judgement were things she was only beginning to notice in grade school. She wasn’t afraid to flash her smile even though she was missing teeth. And 20 some years later I wonder where that little girl went? I was picked on and peer pressured in school because I was different. I had bullies. And I chose to tone down my creative side and try to fit in. And I was miserable. It wasn’t until college that I started to find my own style again. To this day I love to wear bright colors but I try to do it more fashionably. But that smile and that joy and that confidence you see in the picture have not been so easy to find again. I hope that someday I can flash a smile like that again. I hope that someday I can find that joy inside and feel beautiful because of it. So finally the beauty industry has realized that a generation of us ladies are addicted to ChapStick! More accurately addicted to lip balm, of which ChapStick is only one brand. Our mom’s cherry ChapStick was probably everyone’s first beauty product. But by the time I was in high school Lip Smackers was the huge rage. I had a pretty decorative bowl in my room full to the brim with every flavor of Lip Smackers imaginable and everyday before school I carefully picked out which flavor I was going to use. In my bag I always had my favorite flavors and the flavor of the day. And I re-applied constantly whether I needed it or not. It was the same with all my friends. And to this day I get a Lip Smackers holiday gift pack for Christmas. But as I grew up my lip balm options did not. So most often I would wear a layer of lip balm and then a layer of lipstick or lip stain for color. I ended up having a small make-up bag in my purse just for lip products. But just recently a flood of tinted lip balm products have hit the beauty market and I was more than happy to try them all. Anything to feed my addiction and make my purse a little lighter. I started by trying Burt’s Bees. I really like this more natural line of products. And when I went to the store the tinted lip balm looked huge! Which was good because it was very pricey at $6-$7. I also was impressed that the packaging was made of recycled cardboard. But after first look everything else was disappointing. The huge cardboard tube was just outer packaging. When you pulled it apart a regular sized, plastic tube of lip balm fell out. And the lip balm itself was not worth the price. It had a very minty taste/smell which I disliked and the color was minimal. There was also little difference between colors once applied. Pinks and reds looked the same on my lips. Browns were slightly darker. Overall: not worth the money. Second product up was Maybelline BABY lips. A larger tube compared to average lip balms and only $2-$3. It comes in both tinted and non-tinted varieties. The colored ones are fruit flavored and very creamy. They smell divine and don’t feel heavy. I loved these!! The colors are vivid and you can tell the difference between a red and a pink. They last a little bit longer than an average lip balm too. The only problem I have found is that they fly off store shelves so they can be hard to find. Overall: if you see them, buy as many as you can in every color! And with summer coming I can only imagine they will get even harder to keep in stock. Covergirl came out with Natureluxe. With a spokesmodel like Taylor Swift, this product is very popular. And it is at a mid-range price of $4-$5, making it even more popular. Now Covergirl had an older product that was a larger sized tinted lip balm and some places carry both. The one I am reviewing here is a new release in a green tube. It is a thinner tube but actually holds the same amount as an average lip balm tube. This is a very creamy formula also. The color goes on very nicely at first but it is just a hint of color. The lip balm and color do not last very long at all though. I would say these are only a slight step up from Lip Smackers. Overall: not a stand out. Not in color or lasting effect. And to round out the review I tried Revlon Colorburst Lip Butter. It is on the more expensive side of drug store products and lip balms at $6-$8. It is the price of a regular drug store lipstick. It is very creamy and long-lasting. The colors are vivid and you can tell difference between a pink or a red once it is on. It does feel heavier that lip balm. And I think it might have some plumping elements in it too because when I first put it on I got that tingling plumping feeling in my lips. Overall: More of a lipstick than a tinted lip balm. I am sure there are tons more out there but these were the major ones that I had tried so far. I will always love my lip balms and I am so glad that beauty product makers are finally giving me more options. It always depends on what you are looking for in a product and that matters more than any review. Hope you enjoyed this and please leave comments on what you think!! Here in Indiana the weather is unpredictable and that is putting it nicely. It can be sunshine and 70° in Feburary or 40° and rainy on the 4th of July. That can be horrible for your skin and hair. So I don’t cook or have those kind of reciepes to share, but when it comes to beauty tips and tricks, I have tried it all. And with that I have a ton of knowledge and experience on what actually works. But I am also thrifty. A smart woman needs to look her best but save a dime anywhere she can. And beauty products are notoriously over priced with no return policy. I am also a believer in the more natural the better. And I want to share!!! And now just dump all that into the container and use a spoon to mix it all together. The oil may bubble but that is just as it soaks into the salt. And there is your very own Sea Salt Scrub. Now here is how you use it. All you need is to use two fingers to scoop up some scrub and get your other hand a little bit wet with warm water. Now rub your hands together. Make sure you do the tops of your hands and finger nails too. Just like washing your hands really well for like a minute. Then rinse it off with warm water. You will be able to feel the oil still so don’t try to wash or dry it completely off. The oil will sink in over the next 10 to 30 minutes. The sea salt will gently scrub off the hangnails and exfoliate the dry skin while the oil will naturally soften your cuticles and moisturize your hands. Do this once a day and you will have baby soft hands in no time. Literally you will notice a difference after one use. No lotion needed. This scrub is best used on hands or feet. Definately not your face. Now if you find that the finely ground sea salt is not scrubbing hard enough or if your guy uses his hands in his work and needs more exfoliation, there is also coarsely ground sea salt. The salt grains are bigger and will scrub more. Use it instead of the finely ground sea salt in the recipe. Also make sure you store the scrub in an air tight container or jar. It will last you 3 to 6 monthes. But after that you should throw it out and make a new batch. Also you will notice the oil rises to the top of the mixture during uses. It is ok, just use your fingers to mix it together again right before you use it. This recipe can be tweeked or played with if you want to. If you find it is too oily, just add less olive/alomond oil. Add more salt for a little more scrubbing effect. These kind of scrubs cost $30 and up. I found all the ingedients for this scrub in the aisles of my local grocery store and for less than $10 including a plastic container. Enjoy!